By the time we've made it through a delicious and decadent Thanksgiving feast, our bellies are usually begging us to stop. But then, dessert in the form of pies, cakes, and cookies usually beckons anyway. 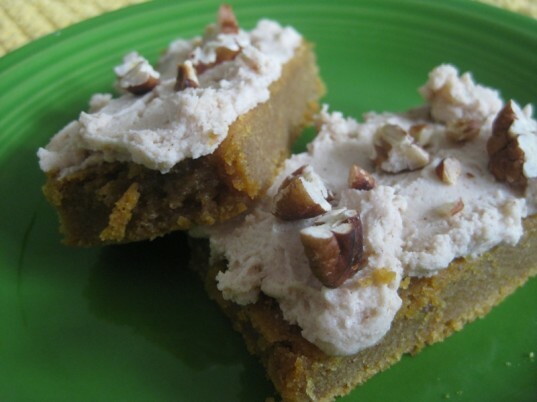 These pumpkin pie bars with cinnamon and maple frosting have a texture that's firmer than a pie, but moister than a traditional bar and are perfect for cutting into smaller pieces. They pack a big flavor punch so you can cut them into smaller pieces - a sweet ending to a gathering of family and friends. Read on for a twist on a traditional Thanksgiving favorite. 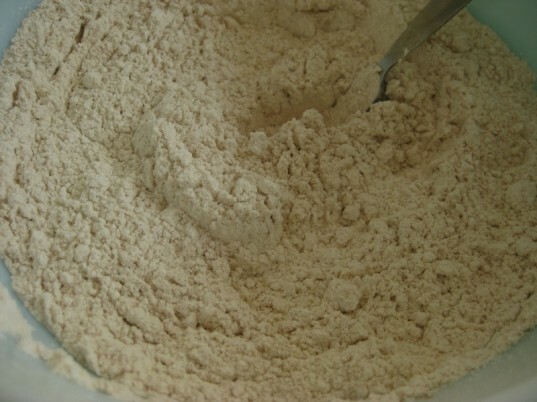 Combine the dry ingredients into a large bowl and mix well. Mix all the wet ingredients together in a medium size bowl. Fold the wet ingredients into the dry, until they are well combined. Pour into a greased 8 by 8 inch pan and smooth the top evenly. Cook for 40-45 minutes until the edges brown slightly and a toothpick inserted into the bars comes out clean. Allow to cool completely. I love frosting, but dislike the mass amounts of confectioner’s sugar that are usually used. 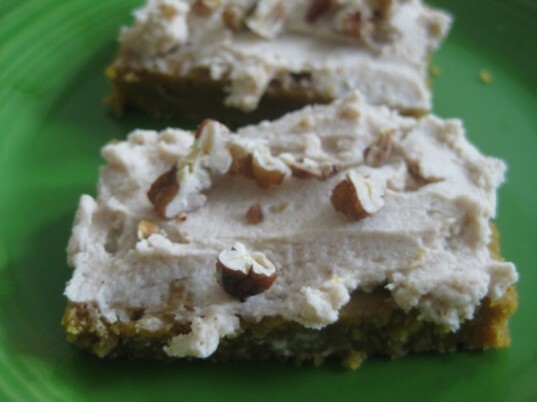 This recipe uses only 1/3 cup and the frosting gets a healthy boost and firming factor from the coconut oil, which solidifies in the refrigerator. Combine all the ingredients in a bowl and beat for 3-5 minutes, until well-mixed and fluffy. Refrigerate for an hour or two, until firm and easily spreadable. 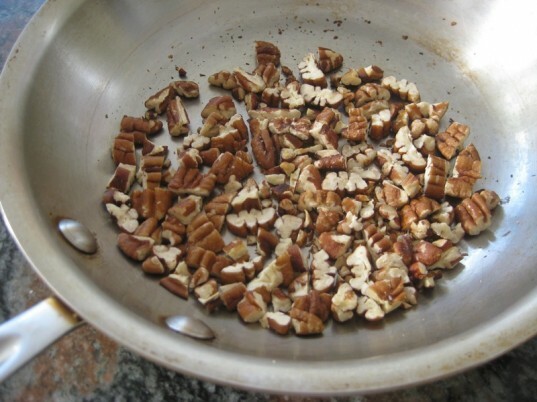 Chop the pecans and toast in a pan over medium heat for 4-5 minutes, watching the pan carefully so that they don’t burn. Let cool. 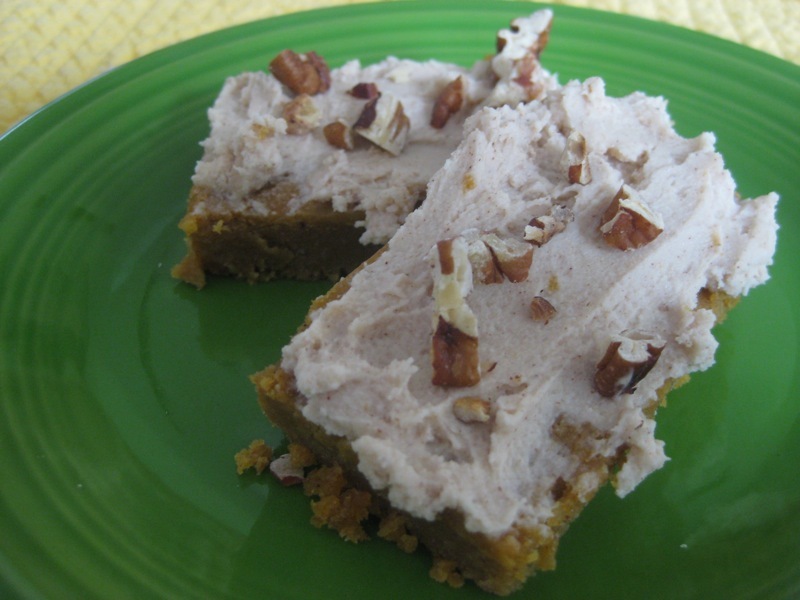 Once pumpkin pie bars have cooled completely (let sit for several hours), frost with the cream cheese frosting and sprinkle with pecans. Cut into pieces and serve. 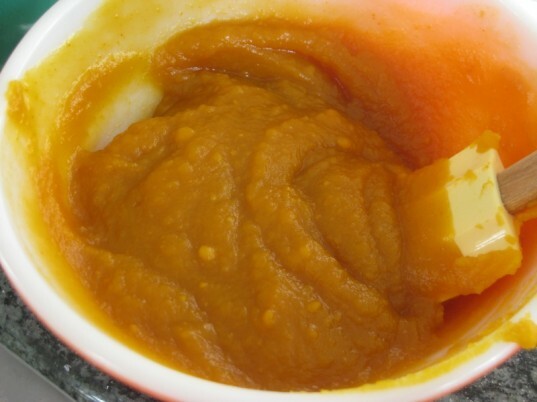 1/4 cup of oil (I used canola) 3/8 cup maple syrup 3/4 cup pumpkin 1 tsp apple cider vinegar 1/2 tsp vanilla 1/4 cup water Mix all the wet ingredients together in a medium size bowl. Fold the wet ingredients into the dry, until they are well combined. Pour into a greased 8 by 8 inch pan and smooth the top evenly. Cook for 40-45 minutes until the edges brown slightly and a toothpick inserted into the bars comes out clean. Allow to cool completely. I love frosting, but dislike the mass amounts of confectioner's sugar that are usually used. This recipe uses only 1/3 cup and the frosting gets a healthy boost and firming factor from the coconut oil, which solidifies in the refrigerator. 1 container vegan cream cheese (I used Galaxy brand) 1/2 tsp vanilla extract 1 tbsp maple syrup 1-2 tsp cinnamon 1/8 cup melted coconut oil 1/3 cup confectioner's sugar Combine all the ingredients in a bowl and beat for 3-5 minutes, until well-mixed and fluffy. Refrigerate for an hour or two, until firm and easily spreadable. 1/3 cup pecans Chop the pecans and toast in a pan over medium heat for 4-5 minutes, watching the pan carefully so that they don't burn. Let cool.